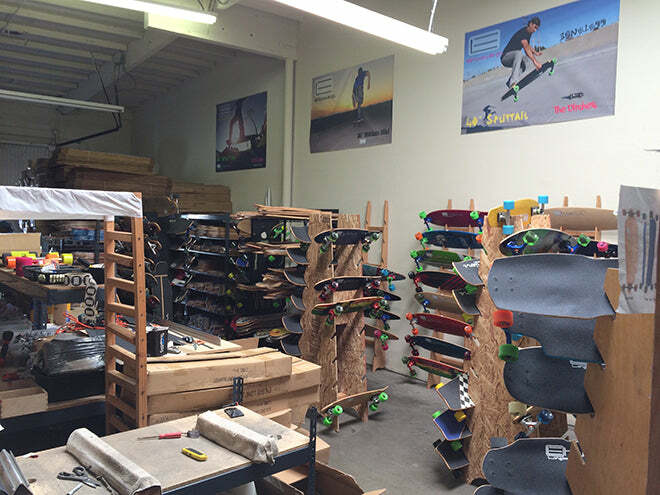 Based in Huntington Beach, CA, Ehlers longboards is assembling longboards and skateboards in a local warehouse. Ehlers longboards has high quality skateboards and longboards for affordable prices with and without their brand name. We met the owner Ryan Ehlers, a very knowledgeable and nice guy who explained and showed us all the boards. He is skateboarding well over 20 years and has a great passion for the industry. He started out of his garage and since then Ehlers longboards has been excelling and expanding every since. They are growing at a rapid pace as demand is rising and the business is booming. You can buy graphic longboards completes, decks or blank ones and you can customize your own board. If you want orange wheels, and bright green trucks, all is possible. Blank decks are available in many colors and shapes. From drop though longboards to the classic pintail longboards in different sizes. Incoming boards are well protected with plastic to avoid damage. All components such as trucks, Zaza wheels and Ehlers wheels, bearing, griptape, risers, hardware and bushings are there for you to choose. When you buy a longboard or skateboard, your board will be assembled at that moment and it will go in a shipping box right away to protect it from any damage. You can find a photo studio in the back of the warehouse where they make high quality pictures. The warehouse is open to the public on weekdays, so if you are in the neighborhood do bring a visit to Ehlers Longboards and say Hi from us at Longboardsusa. Our favorites: All the boards are available as just the deck only or as a complete longboard. If you are looking for good wheels, the Zaza wheels from Ehlers are made out of high quality urethane and are available in 65mm and 70mm in different colors. You cannot go wrong with an Ehlers longboard. High quality boards for reasonable prices. Get yours today. Thanks Ryan for a great and informative visit!